The Mill-Max family of bi-furcated pins are a fine example of Mill-Max ingenuity in designing, and skill in manufacturing precision-machined pins. Mill-Max bi-furcated pins have a .040" diameter to mate with a wide range of Mill-Max receptacles using our #34 contact. The pin mounts on the edge of a printed circuit board with the pin parallel to the board. The square section presses into a hole near the edge of the board, and remains secure prior to wave or reflow soldering. 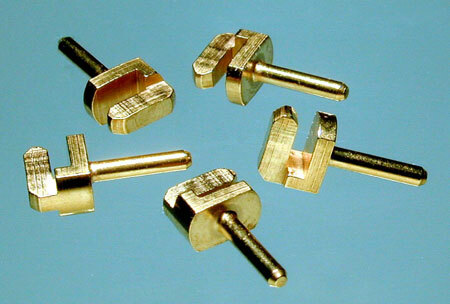 This pin is widely used for the cable TV industry. It is commonly used in groups of 3 or 5 on the edge of a filter card used in CATV distribution amplifiers. The rugged design is ideal for field installation over the 20 year anticipated life of the equipment.